Kenya is a country in East Africa and it lies on the equator. It is bordered by Tanzania to the south, Uganda to the west, South Sudan to the north-west, Ethiopia to the north and Somalia to the north-east. The Flag of Kenya was officially adopted on December 12, 1963. The Kenyan flag is based on the black over red over green flag. and later Nilotic tribes, and around the 100 AD, the Bantus who migrated from West Africa. Around that time, the region became a stop on Arab trade routes, leading to the development of Arab and later Persian communities along the coast of Kenya, including the Swahili settlements of Mombasa and Malindi. The interaction between Arab settlers brought Islam to Kenya, as well as other cultural exchanges. The merchants who settled in Kenya conducted slave and ivory trade to India, the Arabian Peninsula, and China. The Europeans began to arrive in 1498, beginning with the Portuguese and the voyage of Vasco da Gama, but they were met with resistance and unable to establish a permanent settlement. The British landed in Kenya in 1888, with the Imperial British East Africa Company, but they faced conflict with the nearby German colonies. The colony became a British protectorate as British East Africa in 1895, and was made into a colony in 1920, calling it Kenya. The British constructed a railway between Kenya and Uganda, and many laborers were brought from British India, bringing cultural traditions and the Sikh religion. In 1944, the Kenyan African Union was formed, marking the first major step in the Kenyan independence movement. A guerrilla coalition was formed, called Mau Mau, to fight the British rule, culminating in the 1956 Mau Mau Rebellion. The rebels were suppressed by the British military, but the British handed over authority to the people of Kenya. Kenya was granted independence in 1963, and became the Republic of Kenya in 1964. In its early independent history, Kenya faced attempted coups and assassinations, and other internal unrest, but in more recent history, the country has stabilized. 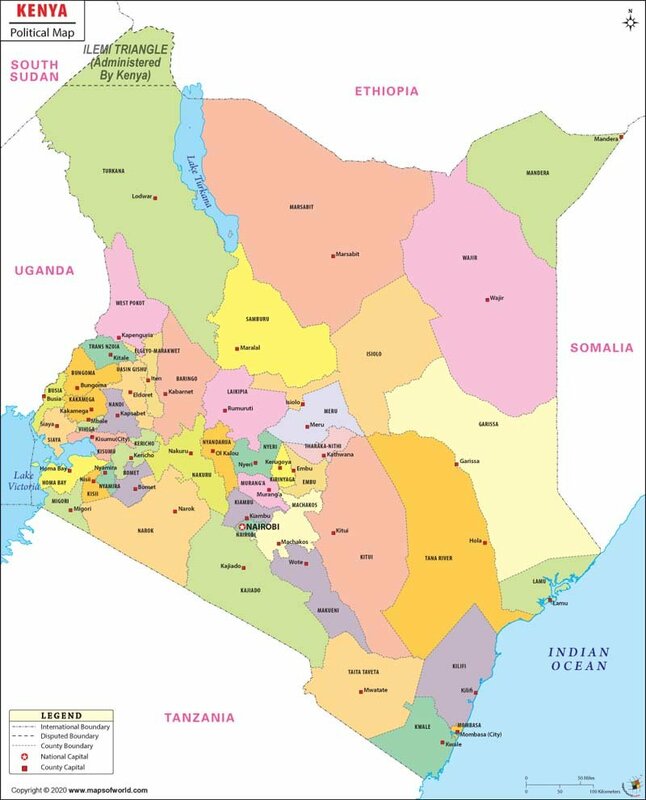 Kenya shares borders with Ethiopia, Somalia, Tanzania, Uganda, and South Sudan. Kenya is located in northeastern Africa, situated along the equator, with the coastline along the Indian Ocean to the southeast. The major features of Kenya's terrain include mountain ranges, divided by the Great Rift Valley, and coastal plains. The highlands of Kenya include the Kenyan Rift Valley, with significant peaks that include Mount Kenya, for which the country is named, and Mount Elgon, which are two of Africa's tallest mountains. Mount Kenya is the country's highest point, which stands 5,199 meters (17,057 feet) above sea level, and is a collapsed stratovolcano. The major rivers in Kenya include the Galana River, Tana River, and Ewaso Ng'iro. 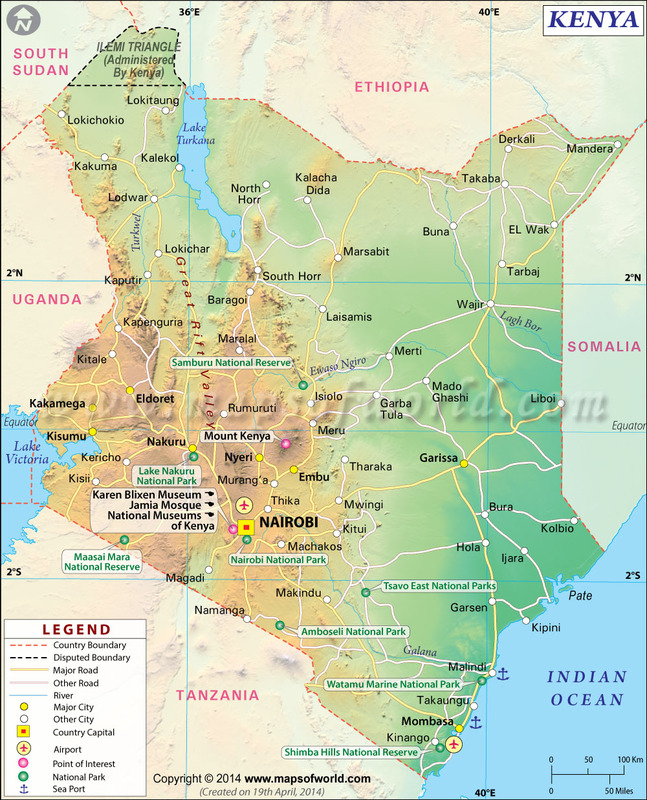 Kenya is located in the Africa Great Lakes region, and its main lakes include Lake Turkana, Lake Magadi, Lake Natron, and part of Lake Victoria. Kenya is best known for its natural and scenic attractions, which include many national parks and game animal reserves, as well as its coastlines and mountain peaks. Masai Mara National Reserve is a popular travel destination for its wildlife, including lions, cheetah, and crocodile, and is also a major site of wildebeest migration, known as the Great Migration. The reserve is also located near the Massai village, where traditional culture can be experienced. Other important parks in Kenya include Sibioli National Park, a UNESCO site, Nairobi National Park, Tsavo East and West National Parks, and Mount Kenya National Park, where visitors can trek to the top of the peak. The capital, Nairobi, has several major attractions of its own, many of which are related to the country's wildlife. These sites include an elephant orphanage, a giraffe center, and habitats for ostriches and crocodiles. The city is home to several museums, like the national museum, as well as the Jamia Mosque. The other important city in Kenya is Mombasa, located along the coast of the Indian Ocean. In Mombasa, visitors can witness Kenya's colonial history, with the historic Old Town, a Portuguese fort, and architecture in many architectural styles, including Portuguese and Islamic styles. The main international airports in Kenya are Jomo Kenyatta International, in the capital, Mombasa's Moi International, Kisumu International, and Eldoret International. These airports offer service all around the world, with plenty of regional connections to destinations around Africa, as well as select destinations elsewhere, like Mumbai, London, and Dubai. Kenya has a railway system that travels between its major cities, known as the Lunatic Express (though it runs fairly slowly), but there is not currently a way for passengers to travel into Kenya from other countries by train. Buses, however, are available from Tanzania and Uganda. Long-distance buses are available between cities, which can be dangerous and are recommended to take during the day. Within cities, there are inexpensive local buses with frequent service. An alternate option for shorter distance travel is the matatu, or the minibuses, which can provide some excitement and adventure, which is to say that they can be driven recklessly and may not be well maintained, but are very inexpensive and fast. Driving around Kenya is best done in a jeep, and car rentals can also include a driver to navigate the roads. While the cities have a road network, roads in the countryside of Kenya are not always paved or maintained.